Hi everyone….I’ve been away for a while on a little vacation. I’m back and excited to get to work on a few fun ideas. Can’t wait to share. This is going to be an exciting week at our house, my son is starting Kindergarten on Wednesday (tear). This is serious business, going everyday of the week. I’m sure I’ll enjoy it once I get into the grove, but for now it is an unknown to me. I’ll have some one on one time with my daughter and actually get to get into a good work schedule where my afternoons can be devoted to being mommy. Oh the balance of being everything. 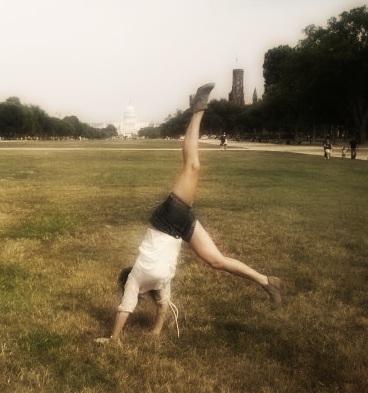 My motto: why not do a cartwheel in front of the Capitol? =) My kids loved it when I sent this picture to them, they were pretty impressed with mommy. And there’s a little insight into my personality. Life should never be taken too seriously, right? I hope you all enjoy your week and if anyone else has kids starting school this week, good luck on that first drop off.